This is RaShawn Jenele Williams. She is a 37 year old single mother of three kids, 17, 15, and 11. 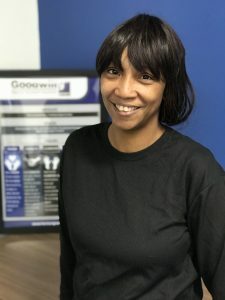 RaShawn first came to Horizon Goodwill in 2011, but it wasn’t until 2017 that she made up her mind to make the rest of her life the best of her life. This is her story. “Hi, my name is RaShawn. I have a 17 year daughter, 15 year old son with disabilities, and an 11 year old daughter. I have been homeless 10 of the last 15 years. I am a child of a drug addict. When I was 8 years old, I was burned on my entire right side. That is my life tattoo. The most blessed people go through the toughest things. I got shot in my leg when I was 23 and almost lost my life. Wrong place, wrong time. Three months later, my mom overdosed and died. That’s when my own drug addiction started. I lost hope at 23. When I came to Horizon Goodwill back in 2011, looking for a job, I think I was looking for so much more, but I couldn’t make it work. I was all over the place and “straying”, not able to hold down a job or take advantage of opportunities in front of me. April, my Goodwill case manager, kept telling me I could have a different life from what I lived now. Instead of listening, I left. Fast forward 6 years: moving from house to house and job to job, I walked back into Horizon Goodwill at their downtown Hagerstown Resource Center and finally asked for help. That’s when I met Tammy, Goodwill’s Get Onboard! Job Readiness Facilitator and the rest of the Workforce Development team. I enrolled in their 10-day program and made sure to come everyday. I wrote my resume, got free interview clothes, and made some new friends. The GED prep classes got me thinking about school again and the financial literacy classes helped me understand what I needed to do to take care of my 3 kids. Tammy showed me how to budget. We broke it all down and I could see what I had to do. She taught me organization. The team also showed me how to be more compassionate. How to deal with people and be more patient. We are all from different walks of life. God sent me to Goodwill for a reason. Like I said, I have been homeless for so long, separated most times from my children or making them move with me. My extended family wouldn’t help me because they all helped my mom and they say, “Look where it got her.” But, now, my oldest is helping me out – we are doing it together. I’m 37 and back in school. I didn’t get my high school diploma or my driver’s license. I am going to get myself a career. Not a job, a career. My goal is to get into Human Resources and help others become who they can be. I want to work with special victims like me. Goodwill took a chance on me, and I want to do that for someone else.